Just about all of us involved in woodworking have somewhere along the way received a pivotal benefit from encouragement, support, or an introduction to the craft from someone. If you have the opportunities, thank that person, then do the same for someone else. Bob Flexner’s reasoned clarifications of all matters of wood finishing are among the most lucid explanations I have read, not only in the field of woodworking but anywhere. His books Understanding Wood Finishing and Flexner on Finishing are essentials for all woodworkers. Just wondering: if you could program a laser to perfectly cut all the joinery in a work of your design, how would you feel about the finished piece? 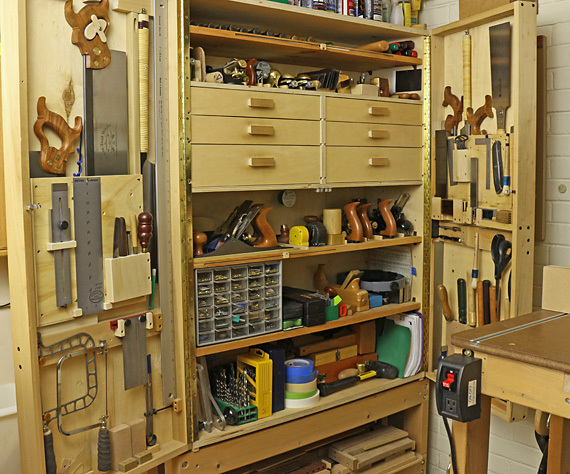 Further, how would you feel about woodworking in general and the aspects of it that are most important to you? With all due respect to period reproduction furniture makers, it must be acknowledged that some of the most difficult steps of creating a piece of furniture have been already been done for them, not least of which is developing a coherent style within and among pieces. Doing excellent work is never automatic. Of course, experience, good habits, muscle memory, and so forth are important, but to achieve excellent results you must bear down and concentrate each and every time. It doesn’t just happen. Sharpness is a magic that solves so many troubles with tools and everything else in the shop. Yet I still hate to stop the workflow to sharpen. Theodore Roosevelt said, “Do what you can, with what you have, where you are.” This speaks so much to us woodworkers, with our tools and wood, in our shops, perhaps bogged down by doubt. It’s worth posting in the shop. Face it, we’re so lucky to be able to make fine things in wood. Lucky, indeed. Also, we are lucky to have woodworkers like you who continue to post such good stuff. Recently I met Mike Mascelli, an accomplished upholsterer in Latham, NY. He apprenticed under very humble immigrant masters, one of whom he quoted as telling him “Don’t show me your tools, show me your work.” That’s a random thought that has stayed with me. Very nice post, Rob. I have you to thank, at least in part, though we’ve never met in person. As for your laser question, I think I’d have a hard time letting go of my work to that extent. I have to answer your laser question – the CNCs, laser cutters, and 3-d printers are great tools which allow people to make things in a different way – these people can still be proud of their finished piece, but they are proud of the design aspect of the work, not the “woodworking” aspect of the work. This is really the polar opposite to the reproduction makers, who can be proud of the woodworking they did, but not the design, because it’s not theirs. Another interesting aspect of the computerized maker tools is that the designs can be shared, so that other people can make the same thing, with much less effort – these people get to be proud owners of a specialized product that they at least assembled themselves. Let’s not forget that as computerized as these maker machines are, they still require some skill and knowledge to work, in which pride can be taken. For me personally, the design phase is the most enjoyable aspect of a project. The cutting and assembly, while enjoyable, is usually more stressful and feels essentially like an obstacle to overcome in order to bring my design to reality, so that I can use and enjoy it. Chris, I really don’t know myself how to answer the laser question, but it’s an interesting question for me because it makes me consider what are really the most valuable aspects of woodworking for me. « Is the finish ever really over?